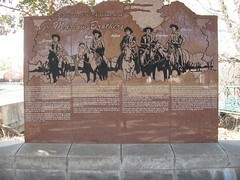 Marlow Brothers Monument is located on the north side of road. Walking from monument cross the foot bridge to the west, the Redbud Chapel is next, follow the walk to the north, the Outlaw Cave is located on the side of the hill to the Northwest. 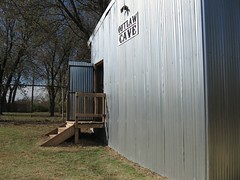 The Cave is enclosed in a metal building. 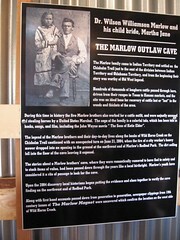 The Marlow family's experiences are worthy legends of the old west. When they settled here during the peak of the cattle drives, this location was ideal for recovering cattle lost among the tickets and dense cross timber woods that covered the area to the east. 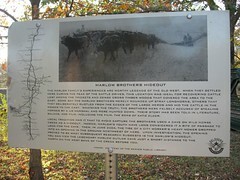 Some say the Marlow brothers merely rounded up stray longhorns, others that the deliberately rustled from the edges of the large herds and hid the cattle in the woods to the east. 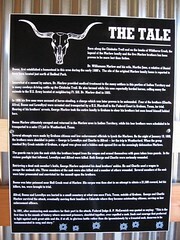 Whatever the truth, the brothers were falsely accused of stealing horses by a US Marshal and were hunted down Their story has been told in literature, ballads, and film, including the film, The Sons of Katie Elder. 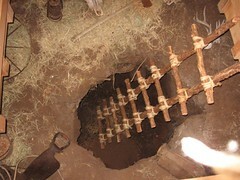 Local tradition has it that to avoid capture the brothers used a cave on Wild Horse Creek as a hideout. Indeed, Marlow's youth have ling considered it a rite of passage to looked for the cave. Then, in June 2004, The tire of a city worker's heavy mower dropped into an opening in the ground northwest of here. 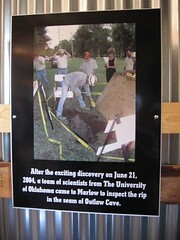 Upon investigation, the opening proved to be what subsequent research suggest is the Marlow 's hideout. 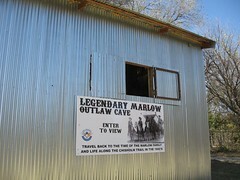 You can view the legendary Marlow Outlaw Cave just a short distance to the north on the west back of the creek before you. 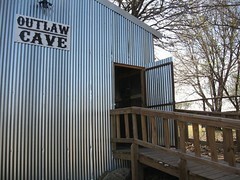 in the seam of Outlaw Cave. "Not many years has passed from the tie of the tragic happenings of the famous Marlows before I came here with my family, the W.T. Ward's in 1895. I am telling this from my own memories, from friends and neighbors. These stories were more of a reality when I was allowed to go to some the places of the happenings. In a group of children with whom I went was Susie Pounds and her brother Walter, who was older and acted as our guide. We went north to the first section line of railroad crossing. 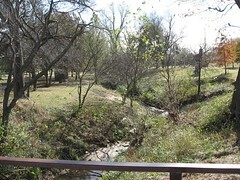 Between there and Wild Horse Creek was then a beautiful wooded area. Still standing was the log cabin, half-dugout home of the Marlow family. Here we had to pull away weeds that had grown up around the doorway. We could have looked through the cracks in the wall where the clay had weathered and dropped from between the logs, but we pushed open the door that hung on one hinge. Hanging cobwebs swished across our faces, daylight streamed from corner rafters: mice went scurrying into hiding under the trash on the dirt floor. I had a feeling we were closing a ghost inside as we pulled the creaking door as merely closed as we could and went to explore the remains of the half-dugout. The planks for the door had rotted and falling. It surely didn't look as if it had ever been home for anyone. We made our way down the creek, our bare feet digging into the cooling soft sand of its banks. I was breathless with excitement as we finally stood at the mouth of the cave, gazing into the hideout of the famous outlaws. Muck like the tumble-down home, use and misused had broken away part of the cave entrance that had once been braced with logs. I was never in the cave, but was told men with lanterns had explored it only to find remains of camping gear. While standing at the water's edge, our feet dangling into the stream, Walter told us the story of the Marlow family as he knew it ......"
The Marlow family came to Indian Territory and settled on the Chisholm Trail just to the east of the division between Indian Territory and Oklahoma Territory, and from the beginning their story was worthy of Old West legend. Hundreds of thousands of longhorn cattle passed through here, driven from their ranges in Texas to Kansas markets, and the site was an ideal base for recovery of cattle lost or "lost"; in the woods and tickets of the area. During this time in history the five Marlow brothers also worked for a cattle outfit, and were unjustly accused of stealing horsed by the United States Marshal. The saga of the family is a colorful tale, which has been told in books, songs, and film, including the John Wayne movie;"The Sons of Katie Elder". 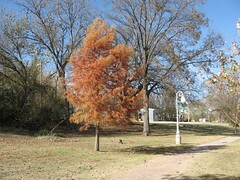 The Legend of the Marlow brothers and their day-to-day lives along the banks of Wild Horse Creek on the Chisholm Trail continued with and unexpected turn on June 21, 2004, when the tire of a city worker's heavy mower dropped into and opening in the ground at the northwest end Marlow's Redbud Park. 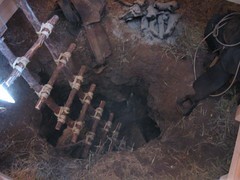 The dirt ceiling fell into the floor of the cave leaving it exposed. The stories about a Marlow brother's cave, where they were romantically rumored to have fled to safety and to stash items of value, had been passed down through the years like a local birthright. 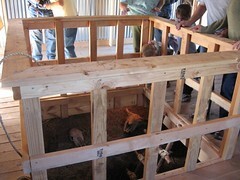 Marlow 's youth have considered it a rite of passage to look for the cave. 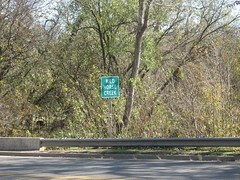 Upon the 2004 discovery local historians began putting the evidence and clues together to verify the cave finding on the northwest end of Redbud Park. Along with first hand accounts passed down for generation to generation, newspaper clippings from 19th century issues of The Marlow Magnet were uncovered which confirm the location on the west side of Wild Horse Creek. Born along the Chisholm Trail and on the banks of Wild Horse Creek, the legend of the Marlow family and the five Marlow brothers has been proven to be more fact than fiction. Dr. Williamson Marlow and his wife, Martha Jane, a relative of Daniel Boone, first established a homestead in this area during the early 1800's. The site of the original Marlow family home is reported to have been located just north of Redbud Park. Somewhat of a nomad by nature, Dr. Marlow provided medical treatment to many settlers in this portion of Indian Territory and to many cowboys driving cattle up the Chisholm Trail. He also farmed while his sons reportedly herded horses, selling many the animals to the U.S. Army located at neighboring Ft. Sill. Dr. Marlow died in 1885. In 1888 his five sons were accused of horse-stealing, a charge which was later proven to be unfounded. 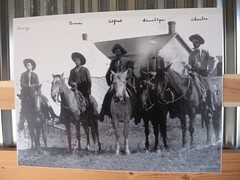 Four of the brothers (Charlie, Alfred, Boone and Lewellyn) were arrested and transported by a U.S. Marshall to the Federal Court in Graham, Texas, for trial. Hearing of his brother's arrests, George Marlow took the entire family to Graham to clear his brothers but soon found himself behind bars. Boone Marlow ultimately escaped and returned to the Marlow area in Indian Territory, while his four brothers were scheduled to be transported to a safer (?) 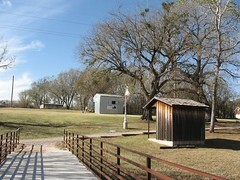 jail in Weatherford, Texas. Several attempts were made by Graham citizens and law enforcement officials to lynch the Marlows. On the night of January 19, 1889, the brothers were shackled in pairs~~George to Lewellyn and Charlie to Alfred~~ for the trip to Weatherford. When the group reached Dry Creek outside of Graham, a signal was given and a hidden mob opened fire on the seemingly defenseless Marlows. The guards ran to join the mob while the brothers leaped from the wagon and armed themselves with guns taken from guards. In the vicious gunfight that followed, Lewellyn and Alfred were killed. Both George and Charlie were seriously wounded. Retrieving a dead mob member's knife, George Marlow unjointed his dead brothers' ankles. He and Charlie used a wagon to escape the ambush site. Three members of the mob were also killed and a number of others wounded. Several members of the mob were later prosecuted and convicted for the assault upon the brothers. Boon was later poisoned near Hell Creek west of Marlow. His corpse was then shot in an attempt to obtain a $1,500 reward, but his killers, too, were brought to trial. 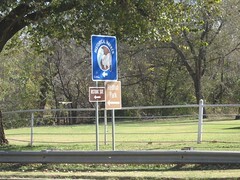 Alfred, Boone and Lewellyn are buried in a small cemetery at what was once Finis,Texas, outside of Graham. George and Charlie Marlow survived the attack, eventually moving their families to Colorado where they became outstanding citizens, serving as law enforcement officers. In 1891, after sentencing mob members for their part in the attack, Federal Judge A.P. McCormick was quoted as saying, "This is the first time in the annals of history where unarmed prisoners, shackled together, ever repelled a mob. Such cool courage that preferred to fight against such great odds and die, if at all, in glorious battle rather than die ignominiously by a frenzied mob, deserves to be commemorated in song and story." 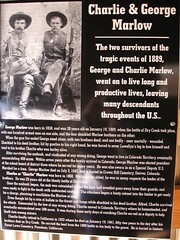 The two survivors of the tragic events of 1889, George and Charlie Marlow, went on to live long and productive lives, leaving many descendants throughout the U.S..
George Marlow was born in 1858, and was 30 years old on January 19,1889, when the battle of Dry Creek took place, with one hundred armed men on one side, and the four shackled Marlow brothers on the other. When the gun fire ended George stood alone, with two brothers dead, and one badly - near mortally - wounded. Shackled to his dead brother, hit by gunfire in his right hand, he was forced to sever Lewellyn's leg to free himself and tend to his brother Charlie who was barley alive. After surviving the ambush, and vindicated of any wrong doing, George went to live in Colorado Territory, eventually accumulating 480 acres. Within seven years after the family arrived in Colorado, George Marlow was elected president of the school board of district 3 where he served for many years. he was also sworn in as a Special Deputy U.S. Marshal for a time. George Marlow died on July 3, 1945, and is buried in Crown Hill Cemetery, Denver, Colorado. Charles or "Charlie" Marlow was born in 1860. While not the oldest, he was in many respects the leader of the brothers. He was 29 years old at the bloody battle of Dry Creek. Once the ambush began, the mob was astonished found the boys had wrestled guns away from their guards, and were ready to fight to the death with undaunted courage. The attackers began a hasty retreat into the timber to get ready for a charge, planning to annihilate the Marlow at once. Even thought hit by a rain of bullets in the throat and lungs while shackled to his dead brother, Alfred, Charlie survived the attack. Exonerated by the law of any wrong doing, Charlie moved to Colorado Territory where he homesteaded, and eventually accumulated over 500 acres. It was during these early days of ranching Charlie served as a deputy to help Quell riots among miners. Charlie finally retired to California in 1922 where he died on January 19, 1941, fifty-two years to the day after his brothers died on Dry Creek. He carried the lead from the 1889 battle in his body to the grave. He is buried in historic Forest Lawn Cemetery, Pasadena, California. Alfred or "Alf" Marlow's life ended under the moonlight on January 19, 1889, during the battle of Dry Creek. At the first alarm of attack, Alfred, while shackled to brother Charlie, jumped over the side of the hack and away from the the mob and as fast as the chains would permit, to the hack where the guards were. Alfred grabbed hold of the barrel of a gun belonging to one the mob. During the attack, three masked men passed close to Alf and fired several times point blank. He threw down his empty revolver, snatched up Winchester to fire back, but fell headlong, with fifteen bullets in his head, shoulder and chest. George shouted to Alfred but only the echo in the lonesome trees answered - Alfred was dead. Charlie was barely alive when George steeled his will, and unjointed Alf's ankle separating the two brothers. Standing 5'7" tall, with slightly bowed legs, Boone Marlow's small appearance was an obvious contrast to his fiery disposition, and no-nonsense attitude. He was by far the scrappiest of the Marlow brothers. His Maternal namesake, Daniel Boone, may have put his mark on him - a fighter and a survivalist. 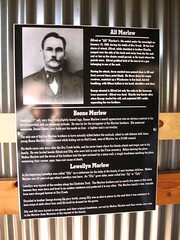 The only one the the five Marlow brothers to have actually killed before the ambush, albeit in self-defense both times, young Boone Marlow was poisoned while hiding out on Hell Creek, west of Marlow , for $1500 reward. His death came only days after the Dry Creek Battle, and he never knew about the bloody attack and tragic cost to his family Hew was buried beside Alfred and Elly, who were laid to rest in the Finis Cemetery. Before leaving the place, Mother Marlow and the wives of the brothers had the spot enclosed by a stone wall, a single headstone marking the place, containing their names, ages, time and cause of death. In the beginning Lewellyn was called "Elly" as a nickname for the baby of the family of now fourteen children. Mother Marlow was 45 of age when Lewellyn was born. A "Elly" grew older, some called him "Ep"or "Eply". 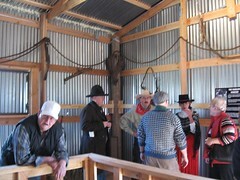 Lewellyn was typical of the cowboys along the Chisholm Trail. The Marlow Brothers put nearly five years at this work, because they were born and bred to an outdoor existence and preferred it to any other. The Marlow family's free, nomadic lives were changed forever at Dry Creek. Shackled to brother George during the gory battle, you Elly was so shot to pieces by the mob that it was necessary to bind strips of cloth about him until he could be dressed for the grave. Elly and Alfred were buried in one grave, and their original headstone, carved by Mother Marlow and their wives, now rests in the Marlow Area Museum at the request of the family. The Marlow Area Museum, located in 127 W. Main, features exhibits of local pioneers, history and color. 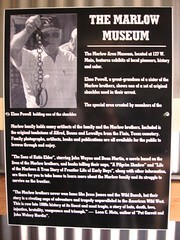 Elmo Powell, a great-grandson of a sister of the Marlow brothers, shows one of a set of original shackles used in their arrest. 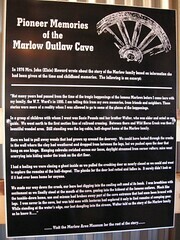 The special area created by members of the Marlow family holds many artifacts of the family and the Marlow brothers. Included is the original tombstone of Alfred, Boone and Lewellyn from the Finis Texas cemetery. Family photographs, artifacts, books and publication are all available for the public to browse through and enjoy. "The Sons of Katie Elder", starring John Wayne and Dean Martin, a movie based on the lives of the Marlow brothers, and books telling their saga, "A Pilgrim Shadow" and "Life of the Marlow's A True Story of Frontier Life of Early Days", along with other informations, are there for you to take home to learn more about the Marlow family and it struggle to survive on the frontier. "The Marlow brothers never won fame like Jesse James and the Wild Bunch, but their story is a riveting saga of adventure and tragedy unparalleled in the American Wild West. This is raw late 1800s history at its finest and most tragic, a story of hate, death, love, injustice, brutality, vengeance and triumph." --- Leon C. Metz, author of "Pat Garrett and John Welsey Harding". 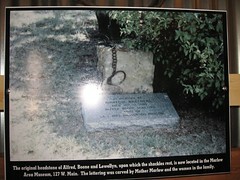 The original headstone of Alfred, Boone and Lewellyn, upon which the shackles rest, is now located in the Marlow Area Museum, 127 W, Main. The lettering was carved by mother Marlow and the women in the family. 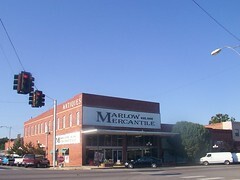 The Marlow Mercantile is the home of the Marlow Museum.